Alexei Yashin was done with the Ottawa Senators. That much seemed clear during the 1999 offseason, with the Russian star insisting the team tear up the one year remaining on his $3.6 million contract. The team refused, so Yashin stayed home, with controversial agent Mark Gandler making it clear that his client would be more than happy to sit out the entire season. Strategically, Yashin’s holdout was as much about time as money. With just one year left on his deal before hitting free agency, it stood to reason that his absolute worst-case scenario was to miss the entire season, at which point he would be able to shop himself to the highest bidder. That would still earn him a financial windfall, and it would get him out of Ottawa once and for all. That was the idea, at least, and Yashin did indeed sit out the entire 1999-2000 season. But then the Senators threw Yashin a curveball. The team (backed by the league) argued that he shouldn’t be declared a free agent after all, on the grounds that he hadn’t fulfilled the last year of his contract. The situation wasn’t actually covered in the NHL’s CBA, so the case went to an arbitrator, who ruled in Ottawa’s favor. Yashin stilled owed the Senators a year of service and wouldn’t be able to return to the NHL until he provided it. He did, reluctantly, sulking his way through the 2000-2001 season. The following offseason, the Senators finally agreed to move him, sending him to the Islanders in a trade for grinder Bill Muckalt, a big but raw defenseman named Zdeno Chara, and the second overall pick in that year’s draft, which they used to select Jason Spezza. The deal turned out to be a disaster for the Islanders2, who signed Yashin to a massive 10-year contract they’d eventually be forced to buy out — a buyout that’s still on their books to this day. Meanwhile, the trade landed the Senators a pair of future superstars in Chara and Spezza, and laid the foundation for Ottowa to become one of the league’s best regular-season teams of the next decade. Blackhawks defensive forward Steve Larmer was entering the option year on his contract in 1993. He didn’t like the money — he was making just $790,000 in a time when star players were well into the millions — and he really didn’t like playing in Chicago. Citing the need for a change of scenery, Larmer informed the team during the offseason that he wanted a trade. In an era where holdouts had become commonplace, Larmer’s wasn’t all that unusual. But there was a wrinkle, and it was one that would impact the league record books: Larmer had never missed a game in his NHL career, and his 884-game iron-man streak left him just 80 behind record holder Doug Jarvis.3 With an 84-game schedule ahead of him, Larmer would break the record by the end of the 1993-94 season … if he played. That led some to assume the holdout talk was a bluff, but that notion was put to rest when Blackhawks training camp opened and Larmer was a no-show. Next came speculation that the league might grant some sort of exception, declaring that games missed due to a holdout wouldn’t count against the streak. That too was quickly shot down. With the Blackhawks dragging their feet on any trade talks, it quickly became clear that Larmer had two choices: Show up, or sacrifice the streak to do it. He stayed home. On October 6, 1993, the Blackhawks hosted Florida in the first game in the expansion Panthers’ franchise history. Larmer wasn’t in the lineup for the first time in 11 years, and his streak was officially over. The holdout would last another four weeks, before Chicago finally agreed to trade its disgruntled forward to the Rangers as part of a three-way, seven-player deal with the Whalers. Despite the end of his streak, Larmer would ultimately get the last laugh in New York, earning his first Stanley Cup ring seven months later. Oh, hey, speaking of that Rangers Stanley Cup win, you may remember a guy named Mark Messier having a little bit to do with that. Messier was no stranger to winning championships, or to coming through in the clutch. He was also no stranger to holdouts. And as the Rangers came to learn, sometimes the holdout giveth, and sometimes the holdout (almost) taketh away. Sather obliged him relatively quickly, making a deal with the Rangers just days into the season in a deal for high-scoring center Bernie Nicholls and prospects.5 At the time, some criticized the Rangers for picking up a player who was already in his thirties; in fairness, Messier turned out to have only another 13 years left in him. Messier didn’t get a new contract, but it’s fair to say moving from Edmonton to New York raised his profile, and he was embraced quickly on Broadway. By the time he had helped the Rangers snap their 54-year Cup drought, you could make a good case he was the most popular athlete in New York. That popularity would take a hit during the following offseason, when Messier announced that he wanted the Rangers to tear up his $2.6 million contract and give him a long-term deal that would more than double his salary.6 He didn’t report to camp, and there was talk he could be traded, including one rumor that had him going to St. Louis in a blockbuster for Brett Hull. In the end, Messier sat out all the way through to late January — not because he was stubborn, but because of the league’s boneheaded lockout that wiped out half the season. When play finally resumed, Messier still hadn’t agreed to a new deal as the hours ticked down to the Rangers’ home opener and banner raising, creating the possibility that the captain wouldn’t be around to see the ceremony. He eventually decided to play and finally agreed on a new contract days later. Holdouts aren’t always about money. Back in 1998, Pavel Bure’s $8 million salary made him one of the highest-paid players in the league. But he wanted out of Vancouver, and he made it clear he wouldn’t honor the one year remaining on his deal until the team traded him. That incident wasn’t the first time Bure had been associated with the idea of a holdout. In 1994, a rumor spread in hockey circles that Bure had threatened to stage an impromptu holdout right before the playoffs if the Canucks didn’t immediately give him a new deal.7 The story was apparently untrue, with even then-GM Pat Quinn denying the demand ever happened, but it badly damaged Bure’s reputation and was one of the many factors that led to his relationship with the Canucks deteriorating. By 1998, that relationship was so bad that Bure told Canucks GM Brian Burke he was done. Burke, as you might imagine, wasn’t thrilled with the news, and he let Bure sit at home until January. That’s when the Canucks finally pulled the trigger on a deal, sending Bure to the Florida Panthers for a package built around Ed Jovanovski. All things considered, the deal worked out reasonably well for both teams. The Canucks got seven years of Jovanovski’s prime. And while Bure’s first season in Florida was a bust (the holdout and injuries limited him to just 11 games), he followed that by leading the league in goals in back-to-back seasons. He was eventually traded to the Rangers and was out of the league by the age of 32, thanks to bad knees. Bure’s rocky story does come with a nice ending. While players like Yashin were never forgiven for forcing an exit from their longtime teams, Bure was eventually able to patch things up with the Canucks organization. His number was retired last year, and Vancouver fans showered him with a loud ovation. By the way, that list of five superstar holdouts is by no means exhaustive — we haven’t even got into guys like Pat LaFontaine or Keith Tkachuk, among many others. In fact, this post might need a sequel at some point. Maybe we can keep it timely by scheduling it for right after Johansen signs in Columbus. So … pencil it in for January? And for the record, I’m not the only one. One of many from the Mike Milbury era. 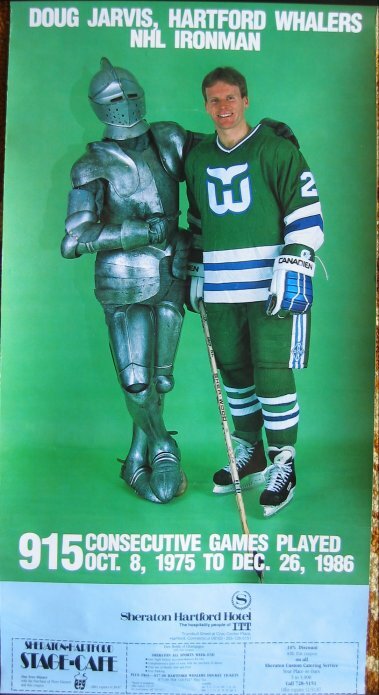 Apropos of nothing, this photo of Jarvis awkwardly posing with a suit of armor makes for some classic ’80s kitsch. This was pretty much mandatory behavior for Oilers stars of the ’80s and early ’90s; guys like Grant Fuhr, Andy Moog, and Paul Coffey also stayed home at various points. Immediately proving he’d fit in perfectly in Edmonton, Nicholls refused to report. Depending on whom you believe, there may have been a clause in his deal that gave him that right after a Cup win. Midseason holdouts were rare, but they did happen; Doug Gilmour used one to help force the 1992 deal that sent him from Calgary to Toronto. QB Curve: Is There Still Time for Michigan to Fix Devin Gardner? A Tale of Two Halves: What Is Going On With the Niners?